Singaporean turtles, more commonly referred to as red-eared sliders or Singapore turtles, are small turtles that are often domesticated and kept as pets. The red-eared slider, or Trachemys scripta elegans, is a popular pet due to its small size and good temperament. There are several things you can do to maintain the health of your red-eared slider. Buy a large turtle terrarium, available at your local pet store. The terrarium should be several times the size of your red-eared slider so that it can comfortably move around. Fill the terrarium with gravel and fake vegetation (available at pet stores). Also give your turtle a place to hide or burrow. Several varieties of "cave-like" or covered terrarium structures are available at pet stores. Place a large rock in one of the corners of the terrarium. Purchase a heat lamp to set over the large rock inside the terrarium. Keep the rock, called a basking rock, at a temperature of 85 to 95 degrees F and the rest of the terrarium between 75 and 85 degrees F. This will keep your red-eared slider comfortable and happy. Place a small water dish in the terrarium. Keep it filled with fresh water at all times. The turtle should always have access to clean water to drink. Feed your red-eared slider regularly. Turtles require different amounts of food depending on their size. If you are unsure how much food to feed your turtle, consult a veterinarian. Feed your red-eared slider a high-protein commercial turtle kibble, available at your local pet store. To supplement this food, give your red-eared slider chopped vegetables such as zucchini, kale, dandelions, squash, endive leaves and collard greens. Take your turtle to see the vet regularly. 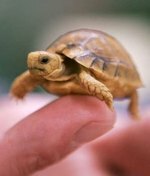 Once you receive your turtle, make an appointment with a local vet who sees reptiles and amphibians. (Not all vets do.) The vet will tell you how often you need to bring your turtle in for check-ups. If your turtle has behavioral changes including loss of appetite, sluggishness or diarrhea, take it to the vet for care.